Violations: Accidentally released during a breeding experiment in Brazil in the 1950s, Africanized honeybees have steadily migrated northward across South and Central America and into the southern part of the United States. 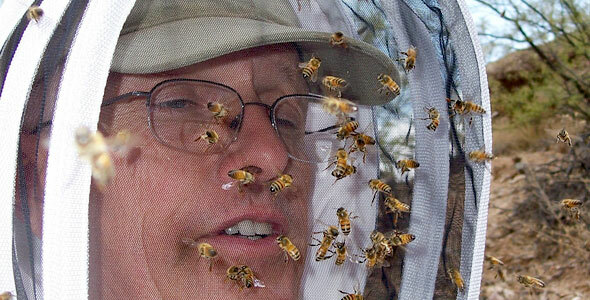 Though they bear a close resemblance to their more docile European cousins, Africanized honeybees are far more dangerous to humans and animals because of their extreme aggression. Quick to attack in large numbers, they react to disturbances 10 times faster, causing victims to receive 10 times as many stings as they normally would from the European strain. 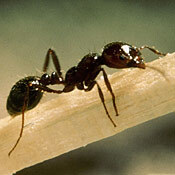 Intensely defensive of their hive, they will chase a person a quarter of a mile or more in order to protect it. Their tendency to outcompete and displace other pollinators is negatively affecting the honey industry, which carries an annual value of $140 million in the United States. 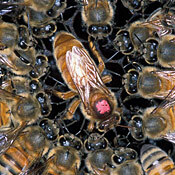 The bees also affect the general pollination of orchards and field crops, with an annual value of $10 billion. Africanized honeybees continue their expansion, but so far, the colder northern climate keeps them confined to the southern states. Violations: All species were brought into the United States from Asia to manage water quality and vegetation in catfish aquaculture in the South. After escaping from southern fish farms during flooding, these four species of Asian carp rapidly worked their way north along the Mississippi, Missouri, and Illinois rivers and their tributaries and could very soon reach the Great Lakes. They pose a significant threat to the Great Lakes because they are large, extremely prolific, and consume vast amounts of food. Weighing up to 100 pounds, they can grow to a length of more than 4 feet and may live up to 30 years. Their keenly competitive nature is likely to have a detrimental effect on the food chain that supports the native fish, as they could eventually become a dominant species in the Great Lakes. Such an invasion would have devastating effects on valuable fisheries, bringing many to the point of extinction. 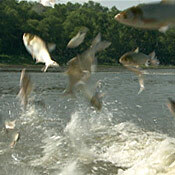 Asian carp also pose an actual physical threat to boaters, as they commonly leap out of the water, crashing into boats and hitting people. There have been numerous reports of people injured by flying carp on the Missouri River, to the point where it is now necessary for boaters to carry personal protection in addition to standard boating safety equipment. It’s possible that a boater could be knocked unconscious, fall out of his boat, and drown. 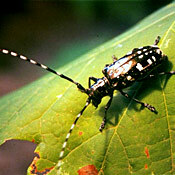 Violations: It is believed that Asian longhorned beetles entered the United States in wood pallets holding pipe shipped from China for a sewer project in the late 1980s, though the first infestation of trees wasn’t reported until 1996. The Chinese government has so far been unable to control this pest in its native China, so the U.S. government is gravely concerned about the damage it may do to American forests. This beetle attacks and kills many hardwood trees, such as maple, elm, horse chestnut, ash, birch, poplar, willow, and many more. It could significantly disrupt the forest ecosystem if it becomes established over a large area. As these trees represent billions of dollars to the U.S. economy by supplying lumber, wood, paper, and maple syrup, among other products, there is an all-out war on this insect. More than 6,000 infested trees have been cut down and destroyed in an effort to eradicate the beetle from New York, as well as more than 1,500 trees in Chicago and more than 600 in New Jersey. Despite the efforts to eradicate this assassin, infested trees continue to be discovered. Violations: After World War II, this stealthy intruder was accidentally introduced to Guam, apparently hitching a ride on military cargo returning from New Guinea. Since then, its population on the island has exploded to approximately 13,000 snakes per square mile. This rapacious predator has eliminated most of Guam’s lizard and bat species and has brought 10 of its 13 native bird species to extinction, including the flightless rail. The snake also poses a threat to humans, especially children. 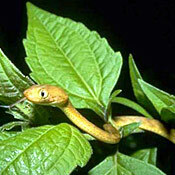 Its venom is weak, but the snake has bitten several hundred Guamanians, most often while the victim is sleeping. It has also caused significant economic damage with its penchant for scaling electrical and telephone lines and infiltrating transformers, causing massive blackouts. Since 1978, more than 1,200 power outages on Guam have been caused by the brown tree snake, at a cost of $1 million per year. A master of contortion, it can coil itself into a small, very confined hiding space, conveniently stowing away on planes and ships. As of yet, the brown tree snake has not formed a self-sustaining population in Hawaii, though individual snakes have been reported. Officials worry that as Hawaii and Guam share similar climate and wildlife, many of the same negative ecological and economic consequences would arise in Hawaii if the snake were to become established there. Violations: This highly aggressive crustacean is one of the most successful invasive predators in coastal ecosystems, with populations established on five continents. Its vast environmental tolerance and high reproductive capacity have allowed the crab to extend its range on the West Coast by nearly 500 miles in less than 10 years, and it is currently expanding northward. Acutely skilled in its foraging behavior, the green crab has been shown to be capable of learning and improving upon its food-gathering techniques. It has a remarkable ability to open bivalve shells in more ways than other crabs, causing it to be much quicker and more dexterous than most. But this crab doesn’t stop at mollusks. 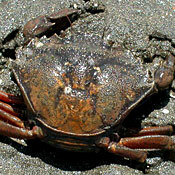 It also preys on marine worms, small crustaceans, juvenile crabs, and shellfish. The annual estimated economic damage to shellfish production is $44 million, and the green crab has been blamed for the collapse of the soft-shell crab industry in Maine. With its ability to outcompete native shore crabs and its insatiable appetite, the green crab can fundamentally alter community structure in coastal ecosystems. Violations: In an attempt to introduce all birds mentioned in Shakespeare’s writings to North America, 50 pairs of European starlings were released in 1890 in New York’s Central Park. Quick to adapt, these birds have since become one of the most abundant and widespread avian species in the United States, with an estimated 200 million now found over most of North America, Mexico, and parts of the Caribbean. Living in large flocks, starlings have been found to have serious detrimental effects on native bird populations, such as red-bellied and Gila woodpeckers, bluebirds, and swallows. 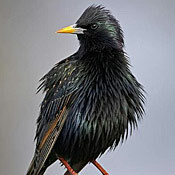 Starlings compete with these native species for nest cavities in trees, rather than excavating their own. Ruthless thieves, they displace the native birds by stealing nesting habitats, often destroying eggs and killing fledglings in the process. Violations: First brought to North America by Spanish explorers to be used as domestic pigs, European wild boars have since formed feral populations that wreak havoc on the ecosystems they inhabit. These secretive, highly adaptive opportunists seek out and destroy native plant communities without regard for rare or endangered status. By rooting the forest floor and wallowing in wetland areas, they raze the vegetation that both prevents erosion and provides food and habitat for native wildlife. They have destroyed breeding sites and degraded key habitats of several endangered amphibians, and pose a serious threat to coastal nesting areas for marine turtles. Their ravenous consumption of food upon which other forest species depend has had a direct negative impact on native animals. As agricultural pests, they cause an estimated loss of 20,000 tons of sugarcane each year. There are also growing concerns among farmers about the spread of infection and parasites to domestic livestock. 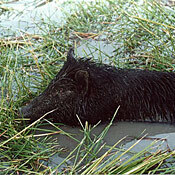 Wild boars are vectors of several serious diseases, including pseudorabies, which is fatal in panthers; swine brucellosis, which can be fatal in people; and trichinosis, a foodborne disease caused by a parasitic worm that lodges in the animal’s muscle tissue. The disease may be passed to humans who consume infected, undercooked meat and can be fatal if not treated. As the feral hog population continues to breed with escaped domestic stock, their genetic diversity continues to widen. Violations: Introduced to California at the tail end of the 19th century, this relative of the beaver was initially bred for fur farming. But when the market for nutria fur proved soft, many breeders released the rodents into the wild. Wildlife agencies unwittingly served to compound what would become a huge problem by introducing the herbivore into other areas of the United States to control noxious weeds. Armed with a voracious appetite, this semiaquatic mammal is charged with the destruction of thousands of acres of wetland habitat. 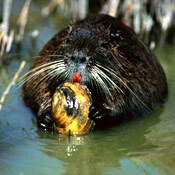 The nutria contributes to coastal erosion, ravaging as much as 40 square miles of Louisiana’s coastal marshes each year. Areas once heavily vegetated have been chewed away, thereby destroying nesting environments for many birds and eliminating critical nursery habitats for juvenile shrimp, crabs, oysters, countless species of fish, and other animals. The perpetrator has also been extremely destructive in the mid-Atlantic states, primarily on the Delmarva Peninsula. The Blackwater National Wildlife Refuge in the Chesapeake Bay area loses approximately 500 to 1,000 acres per year from nutria damage. Highly prolific and without natural enemies, the nutria continues to expand its geographic range at an alarming rate. Violations: Catching a lift from Eastern Europe aboard freighters, zebra mussels reached the U.S.-Canadian border in the late 1980s and rapidly spread to 20 states. These prodigious filter feeders severely affect native mussels and clams by interfering with their feeding, growth, movement, respiration, and reproduction. 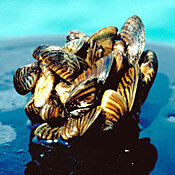 In just one day, a single zebra mussel can filter out nearly all the phyto- and zooplankton in a quart of water. By removing these important food sources, the mussels efficiently starve native populations. Their proclivity to attach themselves to any hard surface means they will colonize a clam or mussel to such an extent that it cannot open its shell to eat. They may also attach to slow-moving species such as crayfish and turtles. Zebra mussels also pose severe problems to humans. They infiltrate and destroy boat hulls, engines, cooling systems, and water pipes. Studies have shown that zebra mussels accumulate pollutants such as PCBs in their tissues in concentrations 300,000 times greater than in the environment. When passed up the food chain, this may present serious health hazards to humans. As a single adult female can produce up to 100,000 eggs per year, the species is spreading at an alarming rate. Its impact on industries, businesses, and communities has cost an estimated $5 billion in 10 years.